This plaque was a gift from Peter Weedfald to HWH PR to commemorate the day. The year was 2003. June 17th to be exact. The next day was the annual Samsung Four Seasons Of Hope Charity at Cipriani’s. The charity raised millions of dollars for children’s causes. I was totally freaking out. My PR agency, HWH PR, worked on this event for a month and we still didn’t have a stitch of editorial coverage for it. In fact, we didn’t have many press people attending the charity luncheon either. I watched as special rafters were being built for camera crews around the perimeter of the catering hall. I rolled my eyes. I didn’t dare tell anyone on the client side. HWH was looking for a miracle. I started working the phones. I’m not sure what made me call Andrea Peyser at the New York Post. I told her my dilemma. She asked which notables were attending and I answered, “Joe Torre, Boomer Esiason, Arnold Palmer, Magic Johnson, Rudy Giuliani, and Bill Clinton. She screamed in astonishment. “I can’t believe you got Giuliani and Clinton in the same room. They hate each other.” That was news to me. They both agreed to attend the event without any restrictions or conditions. I didn’t think Andrea was right. She said she might write a story about it. I didn’t pay much attention. I thought her story would be a few sentences. I woke up early the next morning around 6am. I went to the front door to get the newspapers. There it was. 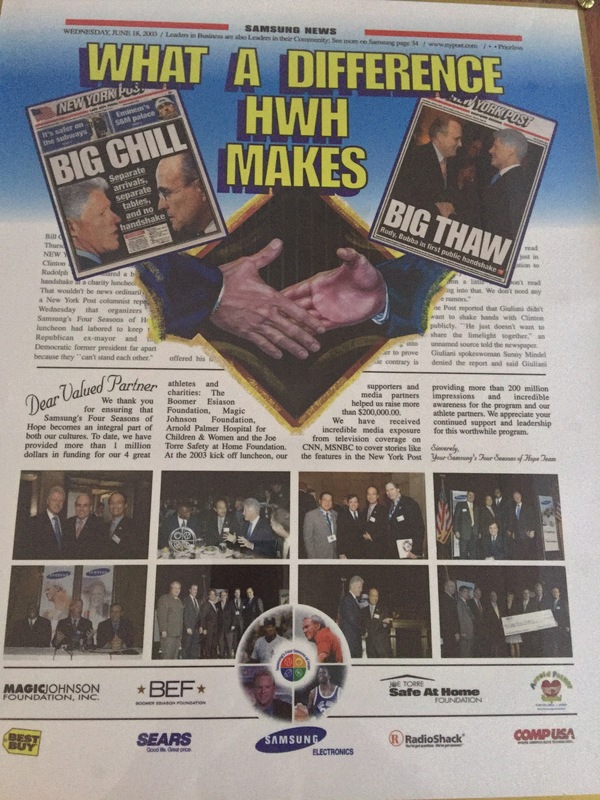 Andrea scored a front page story about Giuliani and Clinton meeting face-to-face at the Four Seasons Of Hope event. I really thought I was going to get fired. The job of HWH PR was to get stories about Samsung, not a political warfare. My phone started ringing. It was the press. All of the TV networks, magazines, newspapers, and radio stations were sending reporters to cover the event. Some wanted to talk to a Samsung official immediately. I was forced to call Peter Weedfald, the person I reported to at Samsung. If I was a betting person, I would have guessed that Peter would have been furious that the charity event turned into a circus. Just the opposite. He seized the opportunity. He quickly confirmed the attendance of both Clinton and Giuliani, and then gave them Samsung message points. He was brilliant and saved the day. Needless to say, the Samsung Four Seasons Of Hope event was standing room only. Everyone read the New York Post that morning and wanted to capture a piece of the story for themselves. Without a doubt, every media outlet was in attendance. The rafters were completely full. In fact, they were so crowded, I thought they would crash. Giuliani and Clinton did not disappoint. They were eager to please in order to garner more publicity for the charities. They both walked on stage from opposite ends. When they got to the middle they shook hands. The press went wild. Cameras were flashing and live reporting went into action. It became a media frenzy. The net, net, was that there was more press coverage for this event than most other parties or conferences in the tech industry. As far as I was concerned, it was all happenstance. I just stood by and watched the events unfold. There were many times, over the years, that I realized how lucky I was that Peter Weedfald didn’t freak when he received my call that early morning. He knew just how to put a proper spin on the news and to make sure the Samsung Four Seasons Of Hope got the publicity it deserved. That’s a talent. Mission accomplished. Thank you Peter. This entry was posted in digital, senior lifestyle, tech and tagged Peter Weedfald, Samsung by loiswhitman. Bookmark the permalink.